Wholesale Bevel & Edge Ltd. is a family owned and operated company, proudly serving Canadians for over 30 years. Our state-of-the-art facility boasts the latest glass manufacturing equipment (automated cutting table, CNC, tempering furnace), thus becoming your ONE-STOP glass shop. 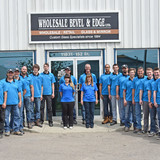 Wholesale Bevel & Edge Ltd. is the only Edmonton-based facility that is 100% self-sufficient; we do it all – from design and cutting, to fabricating, tempering and installing our own products! "We are not interested in ordinary or everyday mirror and glass projects. We are interested in truly amazing, one-of-a-kind artworks," Gary Quaghebeur, owner and president of Wholesale Bevel & Edge. "When we do a job, we take pride in our creation. Each piece is unique. When a project is done in four days, not four to six weeks, and it is beyond quality and safety standards, we know we’ve done our best.” And the best is what the clients of Wholesale Bevel and Edge want. In fact, the best is what our clients demand and receive. Why settle for ordinary when you can make your home outstanding with our unique products and professional services? Let us show you how. Come visit us or give us a call. We are eager to share our expertise and passion for beauty with you! For showers, mirrors, backsplashes, interior entrances, barn doors and much, much more! The Glass Guru of West Edmonton Ltd.
What can a local Saint Albert glass company help me with? If it’s a major home glass repair or replacement, the Saint Albert glass company should work directly with your insurance company to help bring down costs for you, if applicable. Find Saint Albert glass companies on Houzz. Narrow your search in the Professionals section of the website to local glass, mirror and shower door services in Saint Albert, AB and read reviews and ratings to find one that fits your needs.